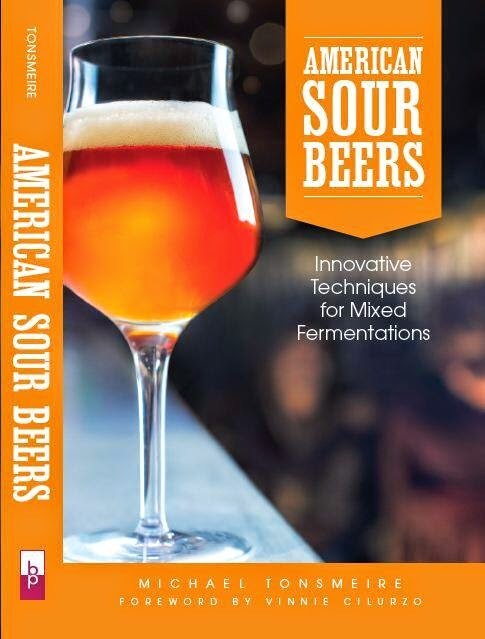 Have you brewed a spontaneously fermented beer? Two weeks ago the just strained sake (separated from the rice) was milky, thick, and slightly sweet (and pretty tasty). After two weeks settling in the fridge an inch and a half cake of rice solids, starches, and yeast had formed on the bottom of each of the jugs. I wanted to split the batch so I decided to bottle some cloudy (as is), and fine the other half with bentonite to make a crystal clear sake. This also gave me a trial run at bottling/pasteurization with only half at risk while the rest continued to bulk age. To prepare the bentonite (a clay fining I had left over from a batch of mead) I mixed 1/2 tsp into 3 tbls of hot water (filtered then microwaved for 25 seconds). After stirring the mixture with a fork for a minute I poured the loose slurry into a freshly sanitized 4L jug. I then racked all of the sake from one of the jugs, plus a bit of the second one onto the bentonite. I gave this sake a brief stir with a bottling wand just to ensure that the finings and sake were well mingled. I topped the jug with an airlock and returned it to the fridge to allowing the finings to go to work. I racked the rest of the sake from the second jug directly into bottles. For such a small amount of liquid this seemed easier than racking to a bottling bucket first, but it led to an uneven distribution of sediment. Some bottles looked pretty clear while others had a good amount of haze. I didn't mind this since it will allow me to see how much sediment (if any) I like in my sake. Sake is a delicate beverage despite the high alcohol content. It is susceptible to off flavors produced by wild yeast and bacteria as a result of the starch (bug food) in suspension and the lack of preservative hops. To help extend the shelf life (allowing it to be aged long enough for proper maturation) it is almost always pasteurized. There are three main ways to accomplish this, chemicals, filtration, and heat. 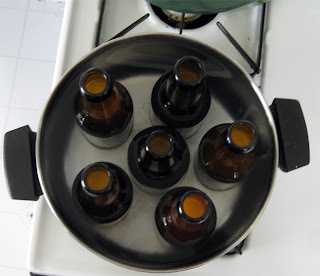 Heat seemed like the most foolproof, and convenient, so I followed Bob Taylor's guide and took the six uncapped bottles and placed them in a pot half filled with cold tap water. I turned the burner on to high. 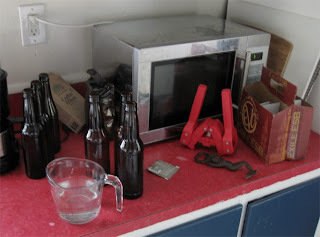 It was interesting to see the carbonation bubbling out of solution as the bottles heated. The sake in the bottles seemed to trail the water by about 20 degrees, so it only took 20 minutes for each one to reach 140 degrees. Once the liquid in each bottle hit 140 I immediately removed and capped them. Pasteurization apparently drives off some of the more subtle/volatile aromatics produced during fermentation, but it also drives off some other less desirable aromatics as well. Heating the glass too rapidly can shock it leading to broken bottles, so don't try to put a second set of bottles in the already hot water. A few days later it was time to do the same thing to the fined portion of the batch. This was a bit easier since the amount of rice/yeast goo at the bottom of the fermenter was much smaller. Five days after that I diluted 3 of these bottles into 6 with filtered/boiled/chilled water and added 1/2 tsp table sugar and a sprinkle of Champagne yeast (aiming for a light carbonated sake, that is to say something I'll be able to drink before November). The sake still needs to age for another 2-6 months to further mellow and age, but I am really looking forward to tasting the results. For the time being I am aging them in the refrigerator to keep them out of the current DC heatwave (even my basement is creeping up towards 80). Hopefully everyone has enjoyed my brief foray into the world of sake production. I just finished reading From Vines to Wines, so I may make my first excursion into wine making sometime in the fall (and probably a couple of sour beers with grapes as well). 6/26/10 Microwaved 3 tbls of filtered water for 25 seconds. Sprinkled on 1/2 tsp of bentonite and stirred for a minute or two. Poured the slurry into a sanitized jug. Racked 1 gallon of relatively bright sake on top. Dropped temp to 35 to encourage sedimentation. 7/01/10 Bottled the fined portion, yielded 10 bottles. Good deal more sediment had settled out, sake looked pretty clear, but not crystal. Pasteurized at 140 as before. Diluting/priming will wait for later. 7/5/10 The fined and pasteurized sake tastes much hotter than the cloudy/raw sake did a few weeks ago, hopefully a few months in the bottle will mellow it out. 7/6/10 Split 3 bottles into 6. Topped off with 6 oz of filtered/boiled/chilled water. 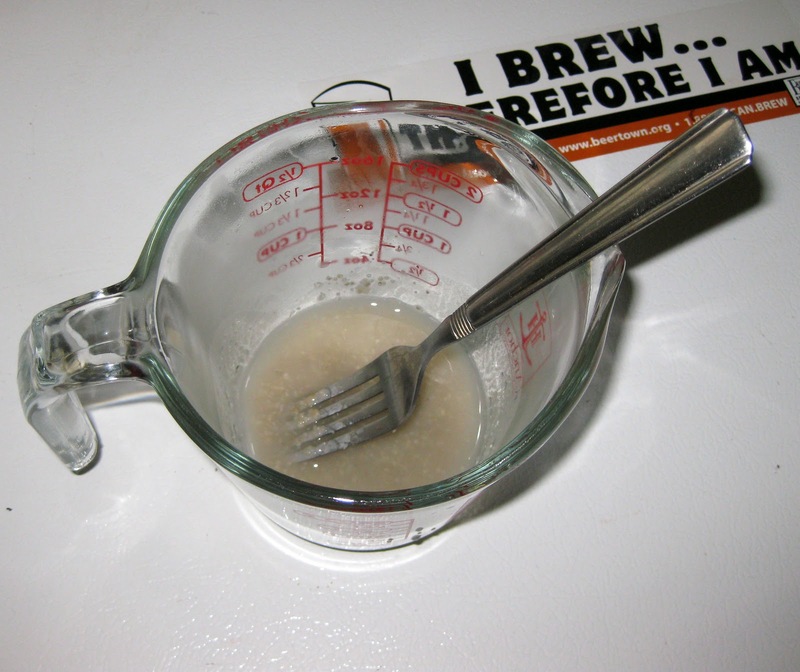 Added 1/2 tsp of table sugar and a sprinkle of EC-1118 Champagne yeast. Capped. 10/7/10 Tasting for the carbonated portion. Fine, but not especially interesting. 10/14/10 Tasting for the fined/undiluted portion. Too boozy and not enough character for my tastes. Excellent work, Mike! For future reference, though: it's perfectly okay to do the first pasteurization immediately after adding the bentonite - the heat won't harm the finings at all. In fact, that's the method that I recommend because, after all, bentonite is dirt. It's also flavorless, so doing your bulk aging on the bentonite lees won't harm your sake (quite the opposite, in fact). With that heat wave you're having, the refrigerator is exactly the appropriate place to store your sake. Props on making the right choice there, man! If you wanted to do it that way would you put the whole jug into a pot of hot water and heat it to 140? I have a variety of refrigerators going, the colder the better? Or would a more moderate temp be ideal? Thanks for all the advice, for my first attempt I'm just happy that the whole process worked. Yep, just treat the jug the same way you did the bottles: taking care to always start with cold water, etc. I mix up my bentonite in the blender, divide it evenly between my jugs of racked sake, then heat each one to 142ºF before capping and allowing to cool slowly on the counter. Colder is better for storing bottled sake. Regarding the weather and temperature in which sake ferments, I agree that aging sake in your refrigerator makes sense. I spent four months in southern Japan on the island of Kyushu working as a kurabito (sake brewery worker) this year. There are about 100 sake breweries amongst the seven prefectures of Kyushu versus 4-5 the quantity in northern Japan. This has a great deal to do with weather. Cold weather is more conducive to brewing sake due optimum sake yeast conditions and overall ease of brewing. Love the blog! Hope to see more posts about sake! Wow, that must have been interesting! Might have another batch of sake in me eventually, but it was just so much work compared to brewing beer. Maybe a ridiculous 100% Brett Trois sake?